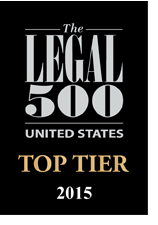 NEW YORK (June 3, 2015) — For nearly a decade, The Legal 500 U.S. annual guide ranked Labaton Sucharow LLP as one of the top litigation plaintiffs' firms in the Mass Torts and Class Action: Plaintiff Representation – Securities category. "Enjoying the respect of the defense bar," according to The Legal 500, Labaton Sucharow's attorneys are "intelligent and reasonable" and "more effective than some of their competitors." The Firm's team of "hard-working lawyers, who push themselves to thoroughly investigate the facts" and conduct "very diligent research," is also praised. Named once again to the elite Leading Lawyers list, the "excellent" chairman Lawrence A. Sucharow and partner Thomas A. Dubbs are praised for leading the team of litigators with "experienced, steady hands" and making "the most of their clients' claims; they set the tone of strong advocacy that is balanced with true assessments of the risks that clients face in litigation." "Key" partners Joel H. Bernstein and Christopher J. Keller are also recommended by the guide for their headline securities class action representation of institutional investors. Led by partners Gregory Asciolla and Jay L. Himes, whose "breadth of experience is exceptional." The Legal 500 also recognizes Labaton Sucharow's Antitrust & Competition Litigation practice in the category of Mass Torts and Class Action: Plaintiff Representation – Antitrust. "A zealous advocate for its clients in M&A litigation," attorneys in the Firm's Corporate Governance and Shareholder Rights Litigation Practice are said to "work hard to study all the issues in their cases and to distill their claims and complex fact and theories into easy-to-understand packages." Christine S. Azar and newly ranked New York partners Ira A. Schochet and Michael W. Stocker are recommended in the guide for their successes in M&A work over the past year. The Legal 500 also noted the promotions of Serena Hallowell, Thomas G. Hoffman Jr., Michael H. Rogers, and Nicole M. Zeiss to partner.